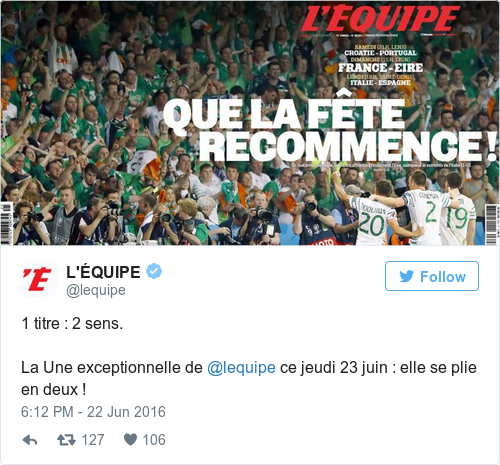 THE COUNTRY IS still celebrating this morning after Ireland made it through to the final 16 of Euro 2016. It’s the first time we’ve progressed to this stage of the football championships and it’s primarily thanks to one man: Robbie Brady. His 85th-minute header was replayed up and down the country last night. President Michael D Higgins was among the Irish fans celebrating in France. Brady graces every national newspaper’s front page today. From ‘The Italian Rob’ to ‘You Lille Beauty’, there are some excellent puns to be had. The headline reads ‘Que la fête recommence!’ or ‘Let the party begin!’. Meanwhile, shortly after the goal, Brady’s Wikipedia page was edited so his name was listed as Robert ‘Jesus Christ’ Brady. Thanks to the eagle-eyed fans who sent us photos of the page. Sadly, it’s now back to normal. Email “There's one man on the front of every newspaper today ”. Feedback on “There's one man on the front of every newspaper today ”.